As they sang the words together, Cassie closed her eyes She was swept up in a feeling... A feeling of power, but a different sort of power than the one held over the strikers by the mayor and the Mounties and the Specials. This power came from the ground and travelled up through her belly and she felt like she shared it with every other worker there was. She felt the power spinning out of her mouth with the song, her voice joining the others’ voices, like they were vines climbing up and over the stone walls of the penitentiary. The vines grew between the cracks of the stones, sending shoots into the cells beyond. In Cassie’s mind, the vines of the children’s song were strong enough to tear down the whole prison and set everyone free. Few authors have chosen the 1919 Winnipeg General Strike as the subject of children’s and young adult novels. Two spring to mind: Geoffrey Billson, whose children’s novel, Goodbye Sarah is about two girls whose friendship breaks up because their fathers are on opposite sides during the strike, and Ruth Latta, whose young adult novel, Grace and the Secret Vault, shows the impact of the strike upon 13-year-old Grace Woodsworth and her younger siblings. Papergirl was written by author Melinda McCracken (1940-2002) in the early 1980s. 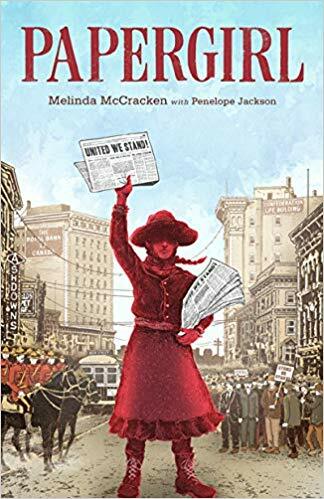 Melinda’s daughter, Molly McCracken, writes that “The manuscript was dug out of the archives and is being published to help celebrate the 100th anniversary of the Winnipeg General Strike.” Molly thanks Halifax writer Penelope Jackson for “editing and enhancing the story” and three historians for providing historical accuracy. Jackson explains in a note that her primary sources were the archived newspapers in the University of Manitoba’s digital collections, the website of the Manitoba Historical Society and Paula Kelly’s documentary film, The Notorious Mrs. Armstrong. The product of two writers’ skills, Papergirl is a labour of love with a mission: to honour the strikers and to inspire those today who seek “labour rights and justice”. This ambitious novel aspires to present the events of the strike, show the radicalization of several characters, convey information about everyday life in 1919, inform readers of women’s role in the strike, and more. Although the novel eventually becomes dramatic and engaging, it gets off to a slow start. Following a brief scene, the opening pages are a narrative of information about the central character’s backgrounds; police officers’ clothing in 1919; the impact of the Great War; the rising cost of living, and techniques of home management and food preservation. This information is recounted, not dramatized. Fiction writers are admonished to show, rather than tell, because without scenes, readers, particularly young ones, may give up on a book before the dramatization starts. Papergirl centres on 10-year-old Winnipegger Cassie Hopkins who dislikes school because the rich kids, favoured by the teachers, look down on working class children. Cassie might be described as “upper working class” as her father and 19-year-old brother Billy are policemen, her mother is a homemaker, and they live in a house with a yard. Cassie’s best friend, Mary, lives with her war-widow mother, a factory worker, in a one room apartment. The story picks up when Billy tells his family that Helen Armstrong, head of the Women’s Labour League, has started a Labour Café at a downtown hotel to feed women strikers for free and men for what they can contribute. Food is a recurring motif in the novel, reminding one of “the justice of eating” which Pablo Neruda wrote about in his poem “The Great Tablecloth”. In Papergirl, there is a scene where hungry strikers’ families fish in the Assiniboine River near the Legislature. There is also some joking as to whether the neighbour’s cat was the protein in a mystery-meat stew. Torn between volunteering at the Labour Café or staying in school, Cassie likes Billy’s suggestion that she sell the strike bulletin. This newspaper, published by the Winnipeg Trades and Labour Congress strike committee, costs five cents and keeps workers informed of developments. As a “papergirl” on a downtown street corner, watched over by Billy who directs traffic nearby, Cassie meets Freddy, a 12-year-old newsboy of Ukrainian background who is supporting his family by selling what he calls “the real paper, the big paper” (perhaps the Winnipeg Free Press, which was strongly against the strike.) He wants to be a “boss” some day, but his experiences during the strike eventually make him pro-labour. Similarly, Mary’s mother, tempted to scab for the telephone company, is dissuaded by the chance to volunteer at the Labour Café. Winnipeg’s business community created a Citizen’s Committee of One Thousand which was dedicated to breaking the strike. As Cassie’s political consciousness grows, she realizes, to her dismay, that the three levels of government and the business community are united in their intention to crush the strike and preserve the status quo. Tensions deepen when the city moves against the police union, which supports the strike, and replaces the Winnipeg police force with Mounties and “Specials” armed with cudgels. In mid-June, strike leaders, including Helen Armstrong’s husband, George, are arrested in the dead of night. The climax comes on Bloody Saturday, June 21st, when the Mounties and special police ride into a crowd, wielding cudgels and firing guns, killing at least one person and injuring hundreds. Fleeing home, Cassie and Mary are attacked by a gang of anti-labour youths, and Cassie is knocked unconscious. When Billy and his friends rescue the children, they make Cassie’s attacker, Nick, fork over five dollars for the strike committee. Cassie’s satisfaction at this rough justice may give some readers pause. Subsequently, Cassie joins a group of children that Helen Armstrong takes to Stony Mountain Penitentiary to sing in a show of solidarity with the jailed strike leaders. (See beginning quote.) The ending is onwards and upwards. The major characters in Papergirl are fictional with the exception of Helen Armstrong. A number of historical figures are mentioned, including the 10 labour leaders arrested on the night of June 17th-18th, and several public figures, including Premier Norris, Labour Minister Robertson, Arthur Meighen, William Ivens and J. S. Woodsworth. Not all of the real “characters” are identified in the way that history knows them best. Readers are told, for instance, that William Ivens was known as “Ivan the Terrible”, but not told why. It wouldn’t have taken too much space to explain that Ivens, a Methodist minister, was considered terrible by the establishment because of his pro-labour, pacifist views and actions. J.S. Woodsworth is identified as someone “helping with the strike, and [who] had written some of Billy’s favourite essays about the workers.” Readers are told that he addressed crowds at Victoria Park and helped produce the strike bulletin but are not informed of his subsequent arrest. Cassie’s parents would have known of J. S. Woodsworth as the former head of the All People’s Mission, founder of the People’s Forum Lecture series, head of the Social Research Bureau and vocal opponent of conscription during the Great War. Papergirl is a worthy contribution to juvenile fiction about the Winnipeg General Strike. Though aimed at young readers, this novel will also interest grown-ups on the left of the political spectrum. Ruth Latta lives in Ottawa, Ontario.